Uruguayan Grilled Stuffed Zucchini (Zapallitos Rellenos) – Viva La Celeste!!! Uruguay! The second smallest country within South America is among the largest nations in consuming beef per capita in the world (what else would you expect from a country that neighbors Argentina and Brazil?). Just like their brothers and sisters across the border, their passion for grilling and futbol are unmatched. Today however, I am not sharing an Asado recipe from our Guacho friends in Montevideo but rather a classic appetizer dish made on the grill; Grilled Stuffed Zucchini – Uruguayan style with prosciutto di Parma, sun-dried tomatoes, and fresh mozzarella. It’s as classic as an Enzo Francescoli or Diego Forlan goal electrifying the La Celeste faithful! To prepare Uruguayan style stuffed zucchini on the grill (also known as Zapallitos Rellenos), buy 2 large zucchinis and cut them in half the long way and carve out the insides about a quarter-inch to the skin (but save the filling). For the filling, by a thick slice of prosciutto di parma, small cup of sun-dried tomatoes, fresh mozzarella, onions and garlic and then with the zucchini filling, chop them all and saute in a pan with olive oil. After a few minutes, add a little flour to thicken it up (the traditional way is to use corn starch, so feel free to use either). 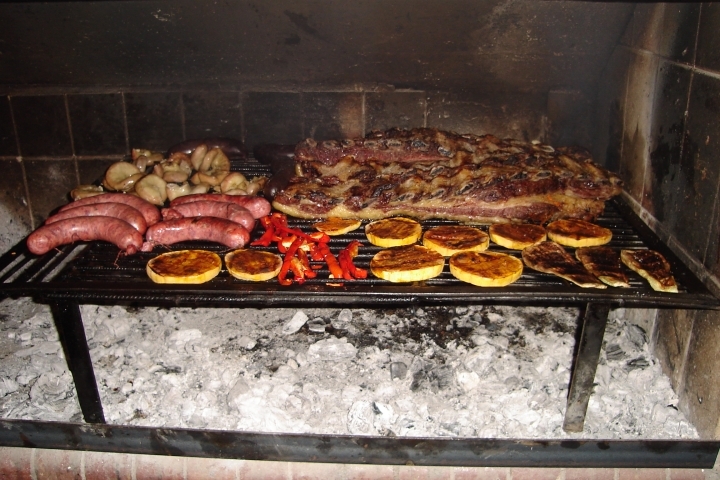 Now in Uruguay, they take their grilling very seriously and use mainly wood to do their cooking. I use (exclusively) lump hardwood charcoal with wood chunks or chips (in this case mesquite) but if you have natural wood, oak is a great choice for grilling. To start the grill, fill up a charcoal starter half way and once the charcoal wood turns grey, dump into your grill pit and oil the grates with a paper towel. Fill the carved out zucchini halves with the stuffing and place them across grates on the grill for 5 minutes before turning a quarter inch. After another 5 minutes, your grilled stuffed zucchini will be finished. In Uruguay it’s not uncommon to serve the stuffed zucchini with mayo on the side but that’s just not Paggi Pazzo’s style. Now for full disclosure, be careful when you remove the zucchini because the heat will flatten the skin and outsides and when I took one of them off the grill, I completely misjudged the weight and it was top heavy dropping to the ground (and making me very, very sad or – muy triste!“). Moral of the story is, watch what you’re doing slappy! Cuisine in Uruguay is very European influenced and this fantastic dish is a combination of many flavors that, yours truly, has created to pay homage to this wonderful South American country. Uruguayan Style Grilled Stuffed Zucchini from Paggi Pazzo, Fuerza La Celeste!!!! After almost 15 minutes of cooking the zucchini filling, add the flour and stir for several minutes until flour has formed a thick creamy texture with the rest of the ingredients. Then remove from oven. 5 out of 5 stars based on 3 ratings. Click here for full Grilled Stuffed Zucchini recipe, and other Paggi Pazzo recipes.